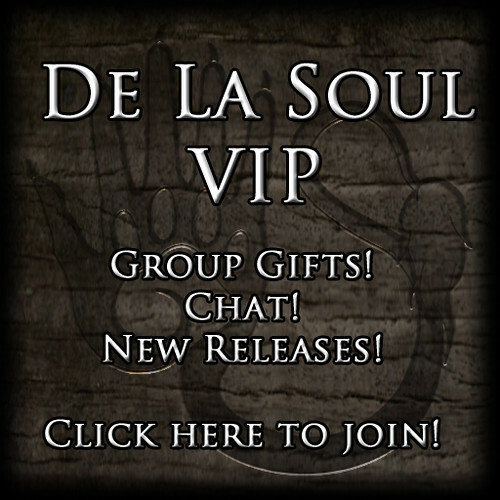 VIP Group & The Seeker | .:Soul:. Got two new things for all of you today! In 3 variations. Male, Female, and Androgynous. The Obi & Beads are texture change via an included HUD. Copy and Modify, No transfer. Two patterns are available, Weave and Fleur. VIP Group now Open Enrollment till Oct. 1st! After that, it will be around 300L to join. I will be sending out my first group gift to the group the first week of October! Join by going to the main store and clicking the sign, then the link in local chat, then Join. This will be the group that receives gifts along with new release notices and has the fun Chat too! I am NOT dissolving the hippo group. That one will remain as notices only. ← 30 Days & Under Gift!